Burlap and lace as wedding decor (or any type of decoration, really) is an up and coming trend. 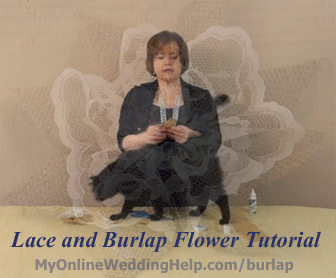 This is why I created this relatively easy way to make flowers. Unlike rosettes, you need no hot glue gun or coordinated folding. The steps for making these blooms involve only fan folding, approximate cutting, regular glue, and loose threading. Watch the video below or go here for written directions and a step-by-step infographic. P.S. My cat, Shadow “co-stars” in this one. Don’t miss the “bloopers” at the end (beginning at 10:44).